Back your way up through the folders in Windows Explorer till you get to the parent folder that is the root of your project. The first thing we need to do is to add Git to our external tools in Visual Studio. To do this we need to first open up the “External Tools” screen which is located under Tools > External Tools… in Visual Studio. note: that I am running this from a 64-bit install of Windows 7, if you are using a 32-bit install your Program Files directory will not have the “ (x86)” on the end. 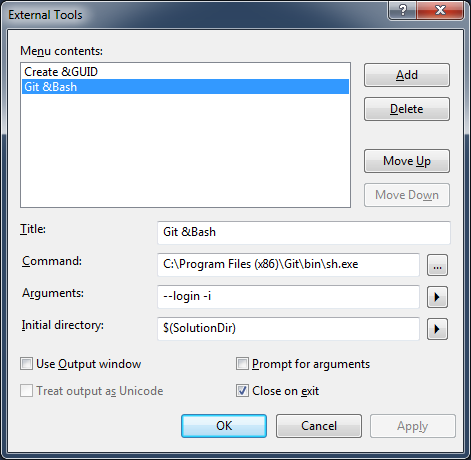 You will now find a new menu item under the Tools menu called Git Bash. This will launch the Git Bash command prompt for your current solution when selected. If you are anything like me you will prefer a keyboard shortcut for opening up the Git Bash command prompt. To setup the shortcut we need to first open up the “Options” screen which is located under Tools > Options… in Visual Studio. Then choose Keyboard from the Environment section. 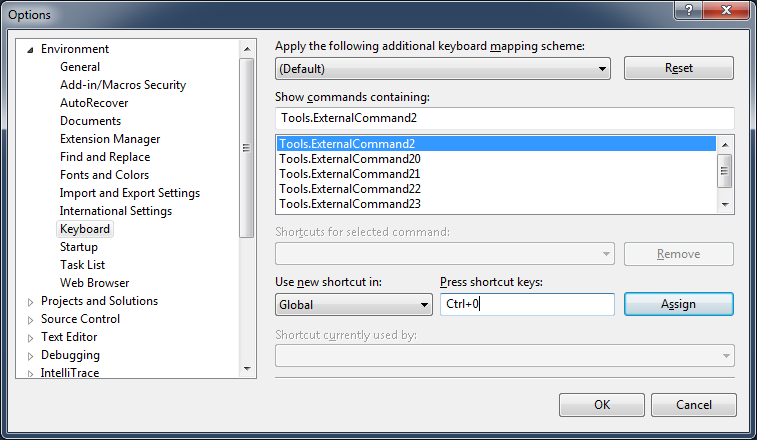 In the Show commands containing text box enter the following in to the text box “Tools.ExternalCommand2” and then in the Press shortcut keys text box press the corresponding keyboard shortcut that you want assigned. (I choose CTRL+0) Then press the “Assign” button and then the “OK” button to exit the “Options” screen. Hopefully this will be helpful to everybody who has the same affection for Git and Visual Studio as I do.